SUMMARY: The relationship between average deal size and length of sales cycle is tight. Smaller deal sizes typically lead to shorter sales cycles. Last week, we saw that average deal sizes for B2B organizations have decreased year over year. This week’s chart looks at the corresponding shortening lengths of sales cycles. Larger deal sizes and longer sales cycles go hand-in-hand. The reverse is also true. In last week’s chart, we saw how average deal cycles declined from 2010 to 2011. 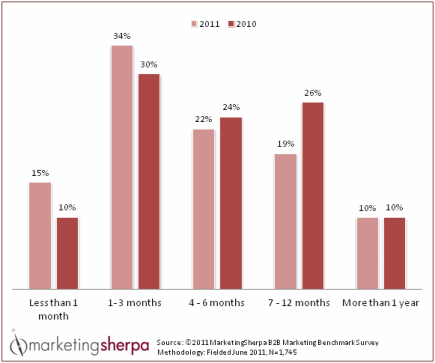 As a result, we see the average length of B2B sales cycles is also shrinking. B2B organizations use promotions to accelerate deals that are already in the pipeline, and win the business faster. Reductions in average deal sizes are apparent, and some organizations have achieved goals with this tactic, and reduced the length of their average sales cycle. Many have not been successful. The year-over-year variance between average deal sizes (from last week’s chart) is greater than the variance in average length of sales cycles. Organizations can address the challenge of a long, complex sales cycle without slashing prices, but they must gain maturity in funnel optimization strategies. By qualifying, scoring and nurturing leads, organizations can increase sales team efficiencies, which lead to higher closing percentages and greater overall revenue. The length of the sales cycle will likely decrease as well, but when revenues are soaring, the challenge of sales cycle length becomes less relevant. For additional research data and insights about B2B marketing, download and read the free Executive Summary from MarketingSherpa’s 2012 B2B Marketing Benchmark Report – Research and Insights on Attracting and Converting the Modern B2B Buyer.